The line of the Mayfair Witches is a long one, rife with sin and curses, blessings and power, full of drama and all along guided by a strange spirit controlled by the matriarch of the clan. NY: KNOPF.. Near Fine. 1990. First Edition. UNCORRECTED PROOF. SIGNED by Anne Rice on the title page. Near fine in plain blue bulky printed wrappers. (Diagonal crease at bottom edge of rear cover) An uncommon advance. .
San Val, 1993-03. School & Library Binding. Very Good. New York: Alfred a Knopf Inc, 1990. Book. N-Fine. Hardcover. Signed by Author(s). First Edition/First Printing. A square tight solid over-all clean un-read copy. This copy has some veryyyyyyyyyyyy minor soil to the bottom pagedges else fine. The priced jacket has some light rubbing wear else fine. A very nice copy of a very good book. This copy includes a copy of Anne at the signing event..
Alfred A. Knopf. Hardcover. 0394587863 First edition, First Printing. Signed by the author on the title page. Not inscribed, price clipped or otherwise marked. Securely wrapped, dust jacket in protective cover and shipped in a box. Very collectible book. . Fine. New York: Alfred A. Knopf, 1990. Near Fine. Uncorrected proof. Wrappers. Cocked with some toning else very good. Signed by the author. NY: Books, May 1993. 1st edition stated. MM paperback in color-illus die-cut wraps.. Fine unmarked, no spine creases.. "A huge and sprawling tale of horror." This rare association copy of PB 1st edition autographed inside the cover for author Mary K. Greer: "for Mary K., Anne Rice." Rare item. 1038 pp. 1991-02-07. New. Ships with Tracking Number! INTERNATIONAL WORLDWIDE Shipping available. Buy with confidence, excellent customer service! 1991-04-11. Good. Ships with Tracking Number! INTERNATIONAL WORLDWIDE Shipping available. May not contain Access Codes or Supplements. May be ex-library. Shipping & Handling by region. Buy with confidence, excellent customer service! Knopf Hard Cover. Very Fine/Very Fine. First edition. The first volume in the Mayfair Witches saga. An intricate tale of evil unfolds beginning when an evil is unleashed in 17th century Scotland when the first "witch" Suzanne of Mayfair, conjures up the spirit she names Lasher, a creat ion which torments each of her descendants in turn. Modern day Rowan Mayfair, a neurosurgeon, rescues a drowning man and brings him back to life, after which he acquires a sensory power that mystifies and frightens him. Together, they se t o u t o t s ove the mystery her past and his unwelcome gift. - 965 pages. New York: Knopf, 1990. 1st Edition. Hardcover. Near fine/near fine. 1st Edition. Hardcover. Signed on first free end page. 2002-08-08. Good. Ships with Tracking Number! INTERNATIONAL WORLDWIDE Shipping available. May not contain Access Codes or Supplements. May be ex-library. Shipping & Handling by region. Buy with confidence, excellent customer service! 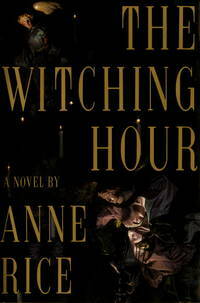 THE WITCHING HOUR: ADVANCE EXCERPT. NY: KNOPF.. Fine. 1990. First Edition. ADVANCE EXCERPT. (25pp.) SIGNED by Anne Rice on the title page. Close to fine in specially designed stapled wrappers. (Hint of faint rubbing at edge of front cover) Consists of the first chapter. NOT the complete book. An uncommon ephemeral item. .
New York: Alfred A. Knopf Inc, 1990. Adventures of Rowan Mayfair and Michael Curry during 'The Witching Hour', November '90. Book has gift dedication dated Christmas, 1990 fep and slightly rubbed spine ends. Price clipped DJ has light edge wear. Book weighs 3 lb. and will require extra postage. Bookseller's Inventory # 081960.. Stated First Edition. Cloth Half Cover. Fine/Fine. 8vo - over 7¾" - 9¾" tall. 1990, 1st edition, as new condition, with an as new dust jacket, with a priced unclipped dust jacket flap, published by Alfred A. Knopf, New York, 965 pages. An extraordinary hypnotic novel of witchcraft and the occult through four centuries. .
Gardners Books. PAPERBACK. 0099471426 New Condition. . New. Alfred A. Knopf. Hardcover. 0394587863 Special order direct from the distributor . New. New York: Alfred A. Knopf. 1990. First Edition; Fourth Printing. Hardcover. 0394587863 . Near Fine in a Near Fine dust jacket. ; 8vo - over 7¾" - 9¾" tall; 976 pages; Original unclipped dust jacket protected by archival Brodart cover. All domestic orders shipped protected in a Box. .
New York: Knopf, 1990. Advanced Reading Copy. Wraps. Good. 8vo, 965 pp. Uncorrected proof. Wrappers creased and worn with one small edge tear, spine creased, page corners bumped, page edges lightly soiled, small stains to a few pages. Alfred A. Knopf. Hardcover. 0394587863 . New. Alfred A. Knopf. Hardcover. 0394587863 signs of little wear on the cover. . Very Good. Alfred A. Knopf. Hardcover. 0394587863 Minor shelf wear . Very Good.